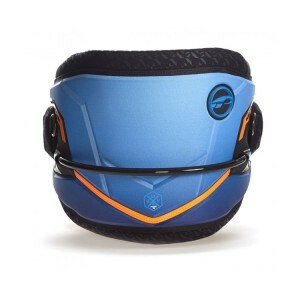 The Kitewaist Pro is Prolimits top end moulded waist harness for people who ride more powered up. It has high back and side profiles for more body contact. The double buckles and straps spread the hook load over a larger area of the harness. Top-end molded waist harness! Optimized molded support and higher back and side profile for more body contact. Double buckles and mulitple Dura Core straps are spreading the Fat bar load over a bigger part of the harness body. Pre-shaping means the harnesses are not made as a flat product that has to be bent around the waist. This would cause bunching and discomfort so the harnesses are shaped during production. They are ready to fit your body when new and dont need to be broken in like a traditional harness. The fit is guaranteed by using the correct 3D anatomical model and aligns the harness surface with the body surface. This means no loaded edges and no unsupported sections in side the perimeter of the harness structure. Even load spread equals comfort. » Pre-curved and 3D shaped. » 4 Point connected Neoprene belt. » High load optimized outline profile. » MPL Quad belt attachment. » Patented Pin Release FAT bar System. » Slide in Barpad for no ride• up. Kitewaist Pro from Prolimit on Vimeo.